VARs, and MSPs can take the advantage of quick deployment, simplifed maintenance, and seamless upgrades with lower total cost of ownership making it a lucratve soluton for businesses looking for the best combinaton of features, performance and value. 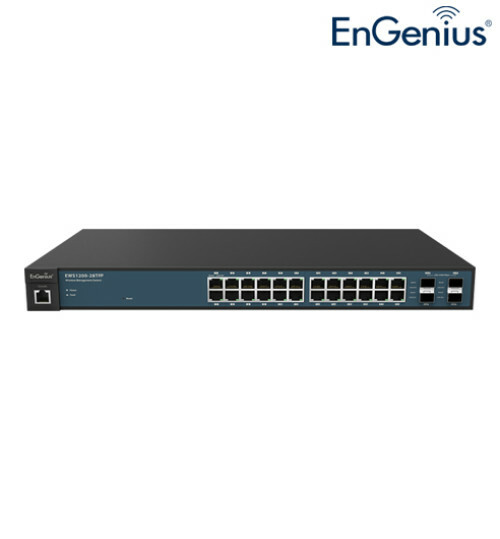 The EnGenius EWS1200 family includes Layer 2 switching features such as IGMP Snooping, MLD Snooping, Port Mirroring, Rapid Spanning Tree, Multple Spanning Tree, Spanning Tree, VLAN group, Voice VLAN, ACL, 802.1X port security, SNMP v1/v2c/v3 and IEEE802.3ad Link Aggregaton Control Protocol (LACP). The IEEE 802.3x Flow Control functon allows servers to directly connect to the switch for fast, reliable data transfer. Network maintenance features include Spanning Tree and Cable Diagnostcs. IT managers, VARs, and MSPs who are expanding network deployments for businesses, schools, resorts and hotels, or other expansive venues can expect superior performance and reliability at a value price point that is much more atractve than from larger, more enterprise focused network brands. Besides its powerful Layer 2 switch features, the EWS1200 also excels as a full featured wireless controller, capable of managing up to 50 Neutron APs. 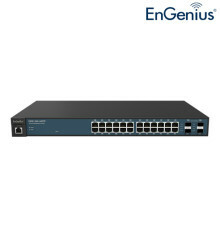 Neutron Switches can automatcally discover any supported EnGenius APs connected to the network with a simple click of a mouse, self-confgure and become instantly manageable. Simply log into the device via a web browser and assign APs into cluster groups. Wireless Radio, Wireless Security and other AP confguratons can all be easily applied to multple APs simultaneously, eliminatng the tme consuming process of confguring each and every wireless AP individually. Any organizaton with limited IT engineer and budget can create a stable and secure wireless network in no tme. Without additonal costs or license purchasing necessary, network administrators can manage and monitor both wired and wireless nodes through a single web interface.